The increasing prevalence of obesity has led to an increase in total knee arthroplasties (TKAs) being undertaken in patients with a higher body mass index (BMI). TKA in morbidly obese patients can be technically challenging due to numerous anatomical factors and patient co-morbidities. The long-term outcomes in this patient group are unclear. This systematic review aims to compare the long-term revision rates, functional outcomes and complication rates of TKAs in morbidly obese versus non-obese patients. A search of PubMed, EMBASE and PubMed Central was conducted to identify studies that reported revision rates in a cohort of morbidly obese patients (BMI ≥ 40 kg/m2) that underwent primary TKA, compared to non-obese patients (BMI ≤ 30 kg/m2). Secondary outcomes included Knee Society Objective Scores (KSOS), Knee Society Functional Scores (KSFS), and complication rates between the two groups. The difference in revision rates was assessed using the Chi-squared test. The Wilcoxon signed-rank test was used to compare pre-operative and post-operative functional scores for each group. KSOS and KSFS for morbidly obese and non-obese patients were compared using the Mann–Whitney test. Statistical significance was defined as p ≤ 0.05. Nine studies were included in this review. There were 624 TKAs in morbidly obese patients and 9,449 TKAs in non-obese patients, average BMI values were 45.0 kg/m2 (range 40–66 kg/m2) and 26.5 kg/m2 (range 11–30 kg/m2) respectively. The average follow-up time was 4.8 years (range 0.5–14.1) and 5.2 years (range 0.5–13.2) respectively, with a revision rate of 7% and 2% (p < 0.001) respectively. All functional scores improved after TKA (p < 0.001). Pre- and post-operative KSOS and KSFS were poorer in morbidly obese patients, however, mean improvement in KSOS was the same in both groups and comparable between groups for KSFS (p = 0.78). Overall complication rates, including infection, were higher in morbidly obese patients. This review suggests an increased mid to long-term revision rate following primary TKA in morbidly obese patients, however, these patients have a functional recovery which is comparable to non-obese individuals. There is also an increased risk of perioperative complications, such as superficial wound infection. Morbidly obese patients should be fully informed of these issues prior to undergoing primary TKA. Total knee arthroplasty (TKA) is one of the most commonly performed orthopaedic procedures in the UK with 108,713 TKAs carried out in 2016 . This number is expected to rise to 118,666 by 2035 . The prevalence of obesity is also increasing, with UK trends predicting a rise from 26% in 2008 to 41–48% in men and 35–43% in women by 2035 . As obesity is a risk factor for osteoarthritis (OA), especially in the knee , the increase in prevalence has led to an increased number of TKAs being performed on obese patients . In the UK, obese patients comprised 56% of primary TKAs in the 2016 . Whilst the exact mechanism is not known, excessive joint loading in obese patients is thought to alter gait and movement strategies, resulting in joint malalignment and cartilage degeneration . In addition, obesity-related dyslipidaemia has been shown to induce joint damage through the actions of pro-inflammatory adipokines and cytokines . The long-term outcome of TKA in obese patients remains a debated issue. Whilst some studies have shown favourable results [8, 9], others have not [10, 11]. Studies attempting to compare the outcome of primary TKA in obese versus non-obese patients have also shown mixed results [10, 12, 13, 14, 15, 16]. Some studies reported increased revision rates, lower functional scores and increased complication rates, including infection [10, 12, 15], whilst others failed to demonstrate any significant difference [13, 14, 16]. This lack of evidence has influenced recent policy-making within the National Health Service (NHS) in the United Kingdom, with some Clinical Commissioning Groups (CCGs) imposing restrictions on offering TKA to obese patients . This systematic review aims to compare the long-term outcomes of TKA in morbidly obese versus non-obese patients. The primary outcome measure was the revision rate and secondary measures included the functional outcome and incidence of complications. The Preferred Reporting Items for Systematic Reviews and Meta-Analyses (PRISMA) guidelines were followed . An electronic database search of PubMed, EMBASE and PubMed Central was conducted, to search for studies reporting revision rates of TKAs in morbidly obese patients. The following search string was used: “(total knee replacement OR total knee arthroplasty) AND morbid obesity”. This search returned relevant studies published between the time of inception of the databases to June 2017. The inclusion criterion was agreed upon by authors LB, AP and SH prior to the identification phase. Studies were included that reported revision rate in morbidly obese patients (BMI > 40 kg/m2) who had undergone primary TKA versus a non-obese group. Studies with a mean follow-up period of less than 2 years and those not published in English were excluded. Studies that did not directly report revision rates were included if they provided sufficient data from which revision rate could be calculated. Screening was performed in three phases to identify relevant titles, abstracts and full texts. Two reviewers (LB, AP) extracted the data through a standardized data collection form. Three reviewers (LB, AP, SH) checked the data for accuracy and any inconsistent results were handled by discussion. The following data: number of patients, number of knees, revision rates, overall complication rates, rates of superficial wound infection, prosthetic joint infection and wound healing problems, mean pre- and postoperative Knee Society scores (KSS) and the mean and range for BMI, age and follow-up were extracted. Non-parametric tests were used for statistical analyses. The significance of the difference between revision rates in the morbidly obese and non-obese groups was calculated using the Chi-squared test. The Wilcoxon signed-rank test was used to compare pre-operative and post-operative functional scores for each group separately. The Mann–Whitney test was used to compare pre-operative morbidly obese and non-obese functional scores and post-operative morbidly obese and non-obese functional scores. Statistical significance was defined as p ≤ 0.05. The PRISMA flowchart for study selection is shown in Fig. 1. 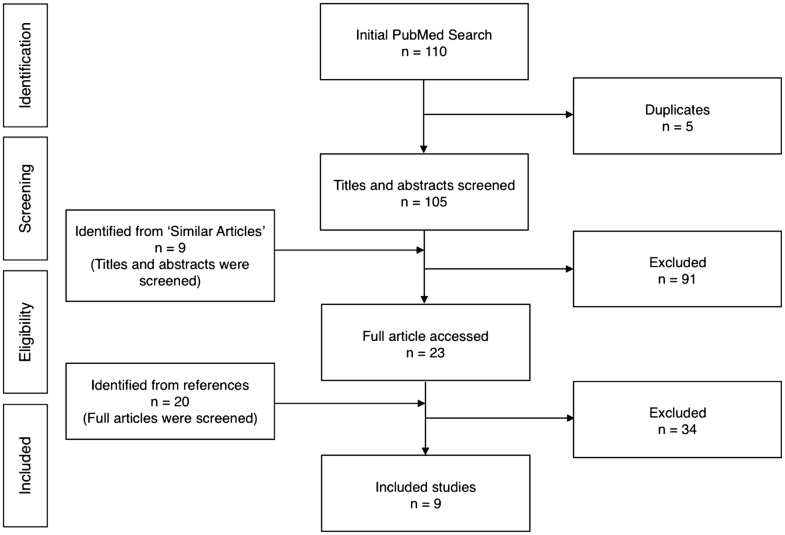 The initial PubMed search returned 110 abstracts which were screened for eligibility. After removal of duplicates, and studies that did not fit our eligibility criteria, nine studies were included for review [15, 19, 20, 21, 22, 23, 24, 25, 26]. The mean revision rates were 7% in the morbidly obese and 2% in non-obese patients (p < 0.001) (Table 2). Two studies reported revision rates directly [21, 26], while in eight studies [15, 19, 20, 22, 23, 24] the rates were calculated as the percentage of knees that underwent revision during follow-up. This review has shown that morbidly obese TKA patient have significantly higher revision rates (p < 0.001) and greater complication rates, including higher rates of infection and wound healing problems, compared with their non-obese counterparts. However, morbidly obese and non-obese patients experience similar improvements in KSOS and KSFS after TKA. All patients undergoing TKA benefit to the same extent from improvements in knee-related function and quality of life, regardless of BMI. Global obesity trends predict 20% of the world adult population could be obese by 2030, equating to 1.12 billion individuals. In high-income OECD countries, including the UK, US, France and Germany, 37% of adults are expected to be obese by 2030 . Obesity is a risk factor for osteoarthritis and contributes to the demand for TKA in these patients. These projections indicate that an increasing number of morbidly obese patients will warrant TKA in the future. Morbid obesity has been widely reported to increase the risk of perioperative complications during TKA, including superficial wound infections and prosthetic joint infections [12, 28, 29]. Whilst the exact mechanism is unclear, this may be partly explained by a weakened immune response in obese patients. The number of monocytes that mature to macrophages was found to be significantly less in obese patients . Impaired release of lymphocyte migration-inhibiting factor has also been found in insulin-resistant, non-ketotic diabetic and non-hyperglycaemic obese patients . Furthermore, obesity is strongly associated with reduced subcutaneous tissue oxygenation, which is in turn linked to higher rates of infection . Our review finds a higher incidence of complications in morbidly obese patients. Amin et al. found the greatest difference in complication rate . No complications were reported in their control group, while 32% of morbidly obese knees experienced complications; 17% were superficial wound infections, and 5% were prosthetic joint infections . This may in part be due to surgery in morbidly obese patients being more technically demanding, resulting in longer operative time which increases the risk of postoperative infections [33, 34]. The association between BMI and the long-term outcome of TKA is unclear. Studies have shown increased revision rates and lower functional scores in obese patients [35, 36, 37] whilst other studies have reported similar outcomes regardless of BMI [9, 38, 39]. Gaillard et al. found that obesity did not affect mid-term implant survival, though their results indicated poorer functional outcomes and a risk of postoperative complications in obese patients . This review suggests that revision rates are greater in morbidly obese patients. Amin et al. reported the greatest difference in revision rates between morbidly obese and non-obese patients, where survivorship rates were 26% and 0%, respectively . A common assumption is that overloading of the knee occurs in patients with high BMI, resulting in greater impact loading across the tibial component, therefore, increased component loosening and poorer implant survival [15, 24, 41]. In spite of this, it has been suggested that a more sedentary lifestyle in morbidly obese patients counterbalances the increased rate of prosthesis wear, which may explain the small difference in revision rate reported in the review [15, 42]. Patient-specific guide technology has also been shown to reliably correct mechanical alignment in obese patients without adversely affecting outcomes . Mean pre- and postoperative overall KSOS and KSFS were consistently lower in morbidly obese patients, though, and perhaps more importantly, the mean score improvements were comparable between the two groups. Chen et al. studied the largest number of patients, 117 morbidly obese and 2108 non-obese patients, and found comparable KSFS between the two groups as well as superior improvements in KSOS . The authors of this study suggest sample sizes in other studies are too small to detect true differences in functional scores. Krushell et al. reported the poorest mean improvement in KSFS of 13 in the morbidly obese group versus 26 in the non-obese group . Though this improvement may seem insignificant numerically, it is approximately equivalent to being housebound preoperatively, and able to walk 400 metres postoperatively . These findings suggest TKA offers substantial benefits to morbidly obese patients in terms of pain relief, knee stability, range of movement, walking distance and climbing stairs. Limitations to this review include the large range in BMI within both study groups and the small sample sizes. Follow-up times ranged from 0.5 to 14.1 years, therefore, making it difficult to compare short, medium and long-term implant survivorship. Other confounding variables included comorbidities, prosthesis type, population heterogeneity, activity level, laterality and surgical technique. Individual ages were not reported in the included studies, therefore, statistical significance could not be calculated. Six studies were retrospective, and therefore, susceptible to selection bias [19, 20, 21, 23, 24, 35]. Our statistical analyses were limited to non-parametric methods, because a normal distribution could not be assumed from the reported data. More randomised controlled trials and prospective cohort studies are required to assess long-term outcomes in morbidly obese patients. This review indicates that revision rate of TKA in morbidly obese individuals is increased compared with non-obese patients [7% vs. 2% (p < 0.001)]. There is also an increased risk of perioperative complications, mainly superficial wound infections. Nevertheless, all patients regardless of BMI experience comparable improvements in knee function. In conclusion, obese patients should be counselled regarding the increased risk of failure and inferior functional outcome, and should be encouraged to lose weight prior to undergoing TKA. These patients, however, should not be refused TKA based on their BMI value alone, as the procedure is likely to offer them a significant improvement in functional outcome and quality of life.